In close collaboration with prof. Vanthienen and prof. De Weerdt we do research on Process Analytics & Mining. A simple event log for a credit application process. 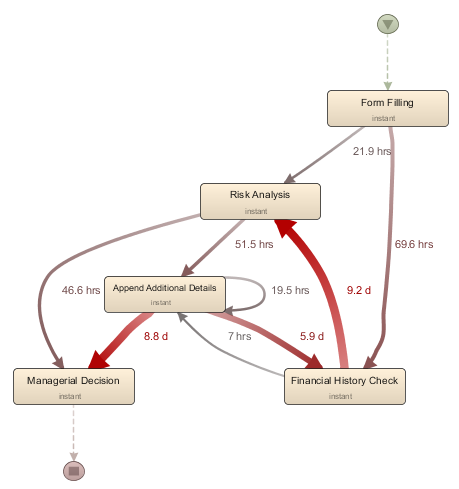 A process model visualising the flows between activities as extracted from the event log. Doing so can help to answer questions such as: “what does the real process look like?”, “what are the common pathways?”, “where are bottlenecks occurring?”, “how do people work together?”, “how do case and activity properties affect the duration or flow?”. The challenge here is to come up with appropriate techniques to make understandable but correct abstractions of the activity flows contained in the event log, as well as highlight important information at a glance, e.g. 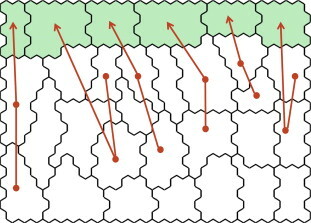 by means of clustering, filtering, or comparison techniques. In some cases, end-users might desire to compare the real-life behavior as described in an event log with a prescriptive model, or simply a set of rules which need to be followed. This can help to answer questions such as “where does the reality deviate from the model?”, “which rules are commonly broken?”, “which SLA’s are not met?” and “why does reality deviate from prescribed rules?”. In most cases, analysts answer the questions mentioned above by means of exploratory, visually-driven analysis. However, we argue that the link between process mining and data mining should be tightened, and are working on research tracks around this topic. This becomes especially important when models become too complex to be inspected visually. In some cases, we have seen analysts making conclusions based on a filtering step (show me the top 10 employees working on cases taking longer than n days) without confirming this globally (what about the top 10 employees for cases less than n days?). As such, we are currently working on answering questions such as: “how does this model evolve over time, what has changed?”, “what are the significant differences between these two models?”, “can we predict the running time or complexity of an incoming case based on the past and its attributes?”. Especially the latter concept of predictive process mining is an avenue we are currently pursuing. Recently, there has been a rising interest in applying process mining techniques in less-internal-process-oriented contexts such as customer journey mapping and dynamic customer segmentation exercises. In our research group, a novel approach was developed towards enabling the exploratory understanding of the dynamics inherent in the capture of customers’ data at different points in time (publication: “A dynamic understanding of customer behavior processes based on clustering and sequence mining”). Our methodology combines state-of-art data mining clustering techniques with a tuned sequence mining method to discover prominent customer behavior trajectories in data bases, which represent the “behavior process” as it is followed by particular groups of customers. The framework was applied to a real-life case of an event organizer, where it was shown how behavior trajectories can help to explain consumer decisions and to improve business processes that are influenced by customer actions. In addition to focussing on customer journeys and dynamic segmentations, we are also exploring how process analytics related techniques can be applied to other types of data “flows”. Web interaction logs in particular (e.g. 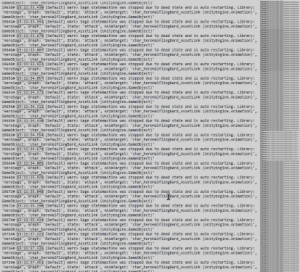 web server logs) form an interesting opportunity in this context. 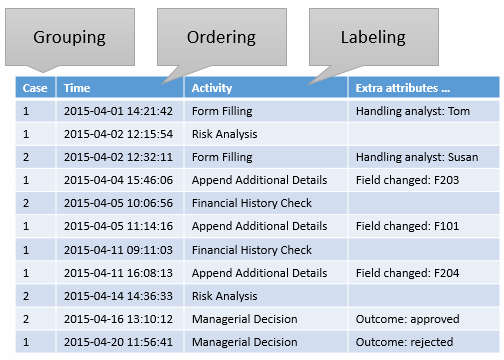 Recall that process mining techniques start from a so called event log to perform their analysis tasks. The following two trends can be observed over the past few years: first, as mentioned above, there is a growing interest to apply process mining techniques in contexts outside of traditional BPM. Second, we observe that data logging practices are rising exponentially. Think for example about audit trails, security logs, application logs, server logs, tracking logs, etc. as emitted by network devices, apps, phones, operating systems, and all manner of intelligent devices connect to tomorrow’s Internet of Things. See www.processmining.be for more information about process mining related research projects from LIRIS, including various software downloads and implementations you can use right away. Ponce de Leon H., Nardelli L., Carmona J., vanden Broucke S. (2017). Incorporating negative information to process discovery of complex systems. Information Sciences. vanden Broucke S., De Weerdt J. (2017). Fodina: a robust and flexible heuristic process discovery technique. Decision Support Systems, 100, 109-118. De Koninck P., De Weerdt J., vanden Broucke S. (2017). Explaining clusterings of process instances. Data Mining and Knowledge Discovery, 31 (3), 774-808. Download prototypes, tools, and more!